The red umbrellas really caught my eye. This restaurant is located in Old City Hall on School Street. 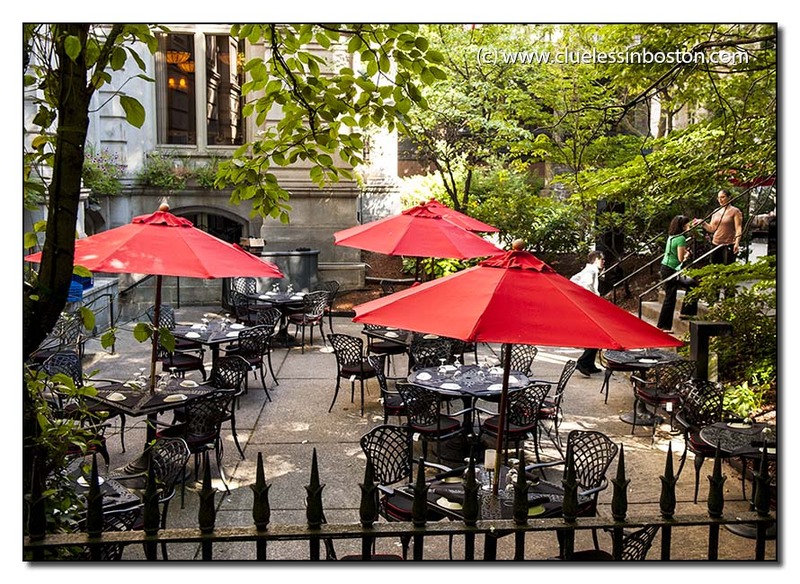 A very nice yard for a restaurant! I think this view will also great when trees will be without leaves. This lovely lunch spot is definitely on my list next time I'm in Boston! No time for lunch... run, run, run! I would have definitely been attracted to this scene also, there's nothing like bright red umbrellas to add a dash of panache to an al fresco eating spot. Amazing what red umbrellas can do for a dining space. I'm putting this restaurant on my list for my next visit. Perfect, Clueless. The red umbrellas and the black iron furniture really stand out. This used to be Maison Robert . . . I read that it closed a decade ago. What is there now?